Leaders of China, Laos, Cuba, and Russia have cabled congratulatory messages to General Secretary of the Communist Party of Vietnam Nguyen Phu Trong on his October 23 election as the State President of Vietnam for the remainder of the 2016-2021 tenure. General Secretary of the Communist Party of China Central Committee and President of China Xi Jinping said in his message that Vietnam and China are friendly neighbours and important partners of each other. Sharing long-standing traditional friendship, bilateral ties have grown fruitfully in an effective manner, bringing practical benefits for people in both countries, he wrote. The Chinese leader highlighted the importance that China attaches to developing Vietnam-China relations and his willingness to work with Party General Secretary and President Trong in pushing the comprehensive strategic cooperative partnership to new heights. General Secretary of the Lao People’s Revolutionary Party (LPRP) and President of Laos Bounnhang Vorachith also sent his message of congratulations to Trong, underlining that the election to such an important post showed the belief and high accreditation of the Vietnamese Party, Government, and people towards the outstanding leadership role performed by the Party chief so far. 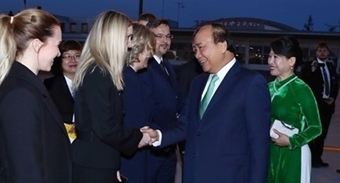 The Lao official said he is confident that under Trong’s leadership in his new post, Vietnam will continue obtaining more significant achievements and the Vietnam-Laos friendship, special solidarity, and comprehensive cooperation will be further enhanced. Similar messages were cabled to the new President of Vietnam by First Secretary of the Communist Party of Cuba (PCC) Central Committee Raul Castro Ruz, and President of the Council of State and Council of Ministers of Cuba Miguel Mario Diaz-Canel Bermudez. The Cuban leaders wished Trong success in his new post and affirmed their determination to strengthen bilateral friendship and cooperation with Vietnam. Russian President Vladimir Putin was also amongst the celebratory senders. His message wrote that the result of the Vietnam National Assembly (NA)’s vote demonstrated the new President’s high reputation during his years of serving at different high-ranking Government and State posts. It also reflected an acknowledgement of the official’s contributions to Vietnam’s socio-economic development and the enhancement of its external diplomatic position. Putin also highlighted the constructive talks between him and Trong in Sochi, Russia last September and expressed his belief in the fortification of the Vietnam-Russia strategic cooperation. The Russian President wished his Vietnamese peer good health and success in undertaking the role of State leader. 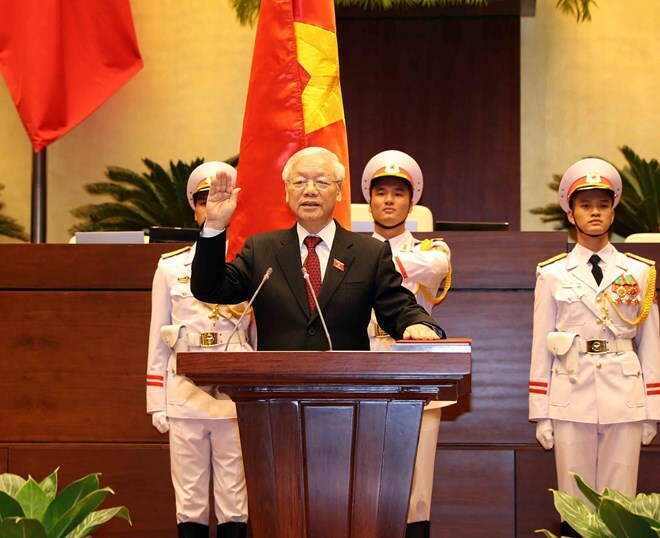 The 14th NA on October 23 elected Nguyen Phu Trong as President of Vietnam. After the results of the vote were announced, the new President had a swearing-in ceremony at the NA hall, vowing to stay absolutely loyal to the nation, people, and the Constitution of the Socialist Republic of Vietnam, and to exert every effort to complete all missions assigned by the Party, State, and people.